Grapefruit: A Secret Cure For Acne? Every few years grapefruit is either praised as a miracle diet food or panned as the source of plant chemicals that interact with medications. The fact is, grapefruit can be helpful in controlling appetite, because it can fill up at the cost of very few calories, and grapefruit juice neutralizes enzymes that the liver uses to detoxify some, but not all, medications. The really useful medicinal part of grapefruit, however, is the seed. People with rosacea may benefit from taking grapefruit seed extract. 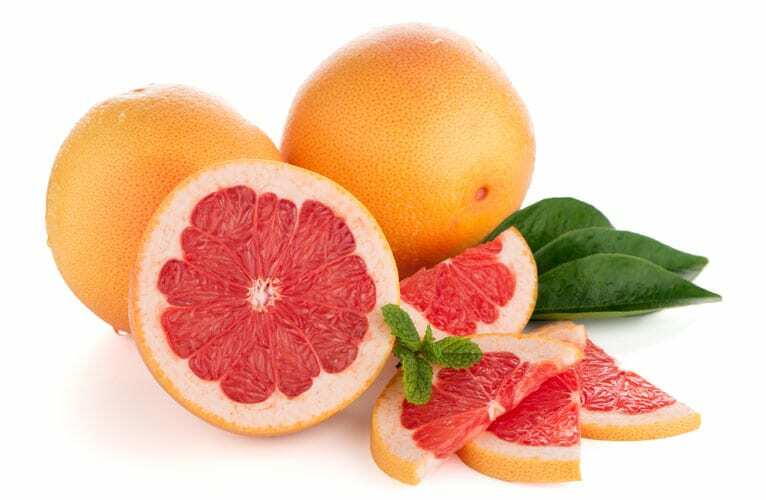 Both grapefruit seed and grapefruit pulp contain potent antimicrobial chemicals. Grapefruit seed extracts kill the kind of bacteria that cause stomach ulcers. These bacteria are implicated in many cases of rosacea. Up to 50% of people who have rosacea benefit from taking grapefruit seed extract. If your symptoms are set off by foods, you are more likely to benefit from taking grapefruit seed extract. Grapefruit seed extract does not kill the bacteria that cause common acne, but it does kill staph and strep bacteria. If you have a problem with impetigo or with pimples that leak brown or yellow pus, taking grapefruit seed extract may help. Allow about 4 weeks for visible results. In botany the grapefruit is known as Citrus maximus, reflecting the fact that the grapefruit is almost the largest of all the cultivated citrus fruit. Grapefruit trees grow 6 to 7 meters (20 to 24 feet) tall, bearing intensely sweet-smelling flowers that are followed by large, yellow fruit. The grapefruit tree originated in China, but was exported to Japan centuries ago, and to the Mediterranean countries and the United States in the nineteenth century. Grapefruit has two colors of flesh. White grapefruit is better for juice, while pink grapefruit is sweeter and more often eaten as a fresh or candied fruit. What’s Special About Grapefruit Seed Extract? In the 1970’s an immunologist named Dr. Jacob Harich started gardening in Florida. He fertilized his plants with compost, which breaks down very quickly in Florida heat and humidity. The one food scrap that did not break down in his compost pile, Harich observed, was grapefruit seed. Harich took some grapefruit seeds back to his lab and started testing. He found that the grapefruit seed extract neutralized hundreds of different strains of bacteria and fungus. The extract also killed many kinds of single-celled parasites. Grapefruit seed extract contains vitamins A, B, and C, as well as the plant compounds naringen, neohesperidin, dihydrocampherol, quercetin, campherol, and apigenin rutoside. Laboratory studies over the last 30 years have found that grapefruit seed extract kills Streptococcus, Staphylococcus, E. coli, Salmonella, Helicobacter pylori, Giardia, and yeasts. Researchers in Mexico City have found that it kills 100% of the skin bacterium Staphylococcus epidermidis in just 48 hours under laboratory conditions. There are two different ways of making grapefruit seed extract. The cheaper way is to soak ground-up seeds and pulp in ethanol (the kind of alcohol in alcoholic beverages) and then to distill the extract from the mixture. This produces more of the naturally occurring antimicrobial compounds in the extract. Another way of making grapefruit seed extract is grinding the seeds and dehydrated pulp and mixing them with virgin coconut oil. The coconut oil does more than just remove the antimicrobial compounds. It creates them by interacting with chemicals in the grapefruit. This method liberates fewer healthy compounds from the grapefruit seeds and pulp but produces more kinds of healthy compounds than soaking the fruit in alcohol. There probably is some infection-fighting power in eating grapefruit (you don’t have to eat the seeds), although there is more in the extract than in the fresh fruit. To get the benefit of 5 grams (a little over a teaspoon) of extract, you would need to eat 1,000 grams (a little over 2 pounds) of fruit. What About Grapefruit Seed Extract for Acne? The kind of acne that is most likely to respond to grapefruit seed extract is rosacea, the kind of acne that breaks out across the center of the face. The problem in rosacea is not clogged pores. It is leaky capillaries that make the skin look red or purple when blood drains into surrounding tissues. Triggers for rosacea include too much sun, coming in from the cold, hot weather, cold weather, drinking alcohol, drinking hot beverages, drinking caffeinated beverages, humidity, indoor heat, medications that stimulate the skin, certain cosmetics, hot peppers, spices, barbecue, marinated meats, and dairy products. Not every one who has rosacea reacts to the triggers the same way. Many people who have rosacea also have an infection with a strain of bacteria known as Helicobacter pylori. These bacteria colonize and form a film on the lining of the stomach. They keep from being dissolved by stomach acid by secreting urea. This kills cells in the lining of the stomach and gives them an anchor. The stomach attempts to get rid of the infection by secreting even more acid, which can cause ulcers of the stomach and duodenum. Antibiotics (and antibacterials like grapefruit seed extract) are often useful for treating rosacea. When the Helicobacter bacteria in the duodenum are killed, the immune system in that part of the intestines no longer has to stay on high alert all the time. This information seems to transfer to the skin, where the immune system produces less of a reaction to allergy-causing substances. In countries where nearly every one is exposed to Helicobacter all the time, bringing the infection under control often cures rosacea. In countries where nearly no one has Helicobacter infection, even if one happens to have both Helicobacter and rosacea, treating the infection usually does not help. Scientists don’t know the reason why. However, the worse the infection in the duodenum, the more likely rosacea is to clear up if antibacterials or antibiotics are administered. Who Should Take Grapefruit Seed Extract for Acne? If you have rosacea, you probably should not start eating large amounts of grapefruit to try to clear blemishes. Your skin might react to the acid in the fruit. However, you should try taking grapefruit seed extract, using the amount of extract recommended by the manufacturer. The small amount of extract in your mouth is unlikely to trigger a reaction in your skin. There is no 100% guarantee that grapefruit seed extract will work. When it helps rosacea, it helps reduce tendency toward blemishes by killing Helicobacter. This is useful for up to 50% of people in Latin America, but only about 10% of people in most Asian countries. And because rosacea is caused by a combination of factors, grapefruit seed extract will probably only make it better. It is very rare for using grapefruit seed extract to effect a cure. Still, it’s worth a try. Buy products from a company that offers a money-back guarantee, and allow at least 4 weeks for results. Could an Enema Really Cure Acne?